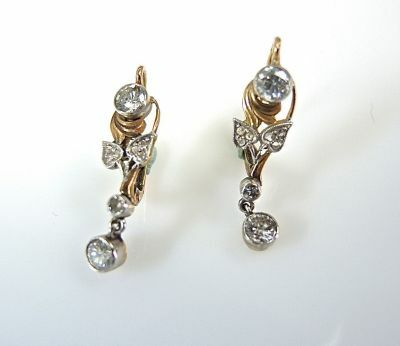 One pair of 18 karat yellow gold with silver top vintage earrings. Four round brilliant cut diamonds (1.22 carats: I1 clarity: J-K colour). Twelve rose cut diamonds (0.08 carats: SI clarity: H-I colour). Two round brilliant cut diamonds (0.08 carats: SI clarity: H-I colour).